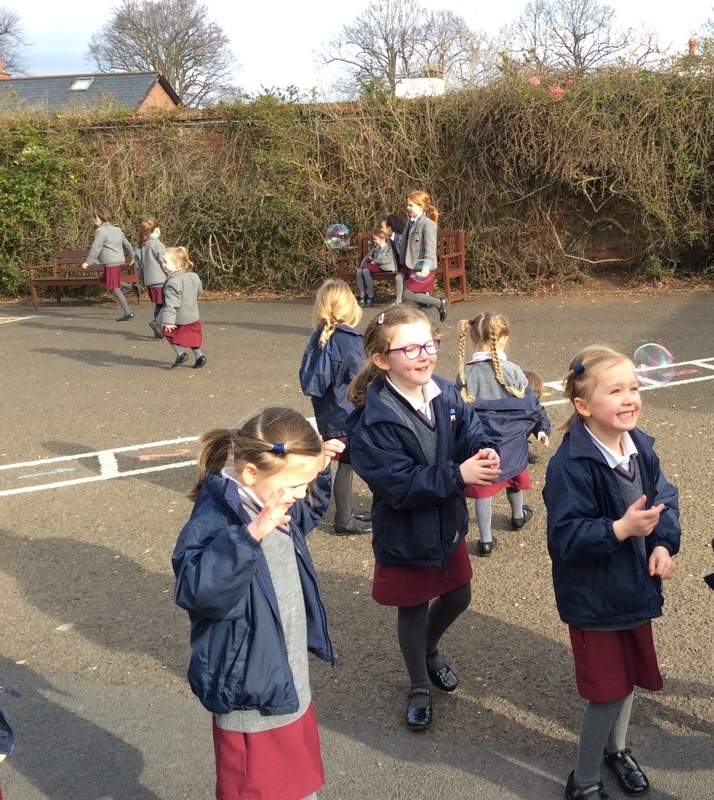 Prep 1 have had a busy few weeks learning about the first signs of Spring, enjoying the warmer weather which we have had some days, and enjoying having our student Miss McKay teaching them. They had great fun out on a 3D shape hunt around the school grounds. They are also really excited about their role as unicorns in Charlie and the Chocolate Factory. Posted on April 2, 2019 by Miss Thompson. Prep 1 have been very busy over the past few weeks developing the skills they had been learning last term. We had great fun wearing our hats and scarfs whilst thinking about describing words to help us when doing our ‘Big Write’. We now can use finger spaces! This week we made our first 10 words sentence when we were practicing our key words. We are now counting and working with numbers within 20, so we are really working very hard. Posted on January 31, 2019 by Miss Thompson. P1 have had a busy few weeks out and about. They have made a hotel for hibernating hedgehogs in down in the school woods, and as part of our ‘People who help us’ topic, have visited the Lisburn Road Fire Station where they spent a most exciting morning using a hose and sitting in the fire truck. They will also be going to the College Library to find out about a librarian’s job. The enthusiasm of the Prep One girls this term has been inspiring. 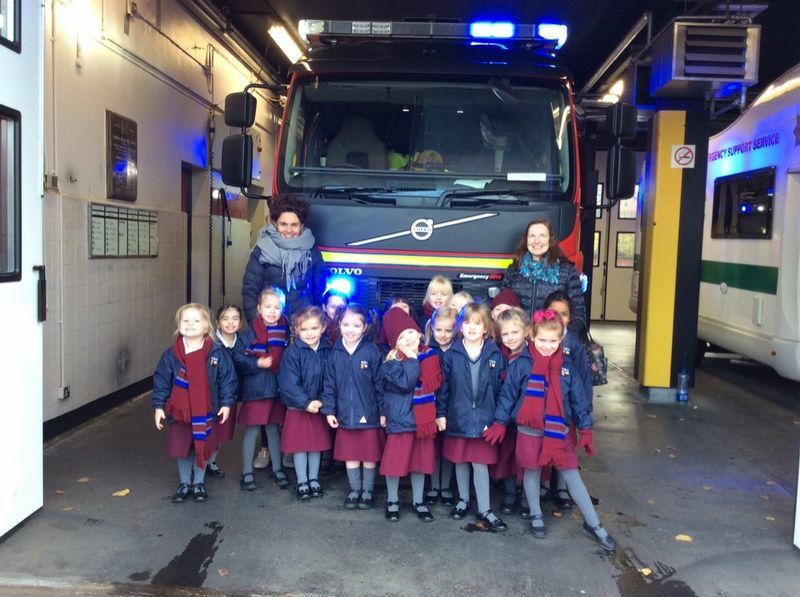 The class recently had a visit to the Lisburn Road Fire Station. They listened attentively, asked excellent questions and were very polite. Well done girls! Posted on March 27, 2018 by Miss Thompson. Learning phonics with Prep 1. B is for bubbles! Prep 1 turned into frogs and hopped along the number line. Ribbit! Ribbit! Posted on February 27, 2018 by Miss Thompson. Prep 1 started the year singing along to a jingle telling us how to use tissues to keep our winter germs to ourselves! We even learnt that it is good to sneeze into our elbows if we don’t have a tissue at the ready! There have hardly been any absences from class this month, so our germs must have been beaten! We learnt how important it is to keep warm in winter and had a lot of fun discovering different ways to do this. Our big Investigation was to see if we could count the right number of cotton-wool marshmallows onto our paper mugs of hot chocolate! We all agreed that tasting real hot chocolate and marshmallows was tops! Prep 1 have been enjoying the crisp autumn days, foraging for seeds and leaves and looking for squirrels. Yes! We were quiet enough to see them. We are learning Mandarin each week with Helena and Janice, students on a placement at Stranmillis University College and enjoying circle games and activities. Our ‘Autumn Café’ has been very busy during play times and the girls have also been sorting coins in preparation for Christmas shopping sprees. Now we are getting ready to be beautiful angels in our Nativity performance, and how sweetly we can sing! Posted on November 30, 2017 by Miss Thompson. It was such an exciting day for Prep 1 enjoying the fun of our first schools Sports Day! Posted on May 31, 2017 by Miss Thompson. Pancake Tuesday was such an exciting day in P1 as we were busy making (and eating!) pancakes. The room smelt gorgeous and the class verdict was that they were really yummy!! Posted on March 1, 2017 by Miss Thompson. Prep 1 were very excited to visit the Lisburn Road Fire Station and meet the fire-fighters. They had a great time looking at all the equipment stored on-board a fire truck and saw just how quickly a fire-fighter can dress in his protective clothes. They also practised using a hose with full gusto, knocking a cone over with the water jet! Prep 1 have had a really busy half-term. They really enjoyed meeting Beverley from Sustrans and finding out about how some people use a bicycle to help them do their job. It was a lot of fun dressing up in bright clothes to remind them how to keep safe on darker mornings and evenings. In class we have been finding out ice and playing in our Ice Palace. We then had a Big Investigation to see if we could get the right number of cotton wool marshmallows onto our mugs of hot chocolate. We have made our own chow mein to celebrate Chinese New Year and Miss Tang gave it a thumbs up! Posted on January 31, 2017 by Miss Thompson. Prep 1 have had a very busy time. We had lots of fun outdoors exploring the school grounds with all their autumn colours and have been very energetic in PE doing our gymnastics. Two Austrian students, Nicole and Laura, have been helping us to learn some German songs and greetings. We have just written our Santa lists and copied the words really carefully so that Santa will bring the right surprises! Posted on December 2, 2016 by Miss Thompson. P1 had a great day out, and really enjoyed seeing the elephants, giraffes and monkeys at the Zoo. Posted on June 29, 2016 by Miss Thompson. P1 girls have been very busyin class, enjoying practical maths activities, learning to write diaries and looking after tadpoles. Of course, we have also been enjoying our outdoor play in the lovely weather! P1 having fun in the sun playing with the new playground toys with their Guardian Angels in P5. The Prep 1 girls are very excited that their frogspawn is beginning to grow legs! Watch this space! Posted on May 25, 2016 by Miss Thompson. P1 have been singing to their Easter Hen, hoping that she will lay some eggs. Jess thinks she will lay chocolate eggs - chocolate ones would be lovely!! Posted on March 22, 2016 by Miss Thompson. We have been busy learning to read, make and copy Winter topic words. I wonder if we have some engineers of the future in P1 with their amazing designs for Ice Palaces. P1 are busy working on the script for Frozen 3! They will be introducing more princesses, a snow pig, puppy and even a vampire, so watch out! Posted on February 1, 2016 by Miss Thompson. Prep 1 raised £66 for the Children’s Hospice by making and selling reindeer dust. We hope it helped Rudolph find his way! Well done girls! Posted on January 8, 2016 by Miss Thompson.